In my opinion, the Mai Tai is the king of all tiki drinks. 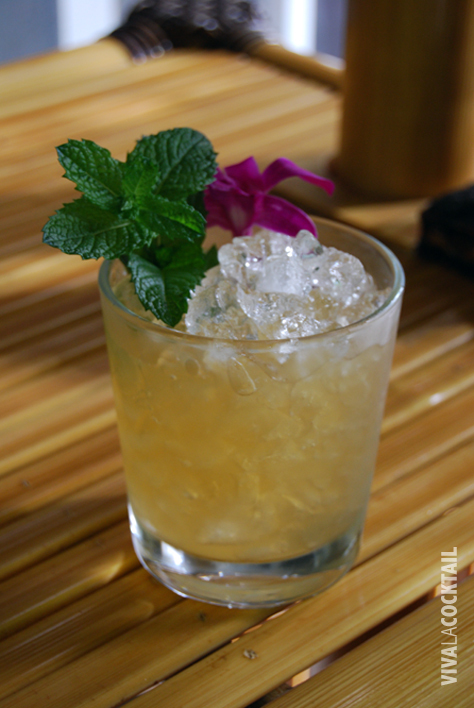 While I have been mixing up Mai Tais for years, it wasn’t until I discovered the forgotten, original Trader Vic’s recipe uncovered by Jeff “Beachbum” Berry that I became a rabid fan. Why? Because the original recipe is a superb blend of quality aged Jamaican and Martinique rums with just the right amount of natural sweetness. No need for pineapple juice and grenadine here! After struggling to find Martinique rums in Oregon, I noticed Clement V.S.O.P. rum from Martinique in one of our higher end liquor stores this year. And let me say that this is the best ever! And I confirmed my choice after reading a post on Mai Tais from RumDood, who is obviously an aficionado of rums (and the Mai Tai). After exhaustive testing of Mai Tai recipes by RumDood using a breadth of rums, it appears that the Appleton/Clément V.S.O.P. came out on top. 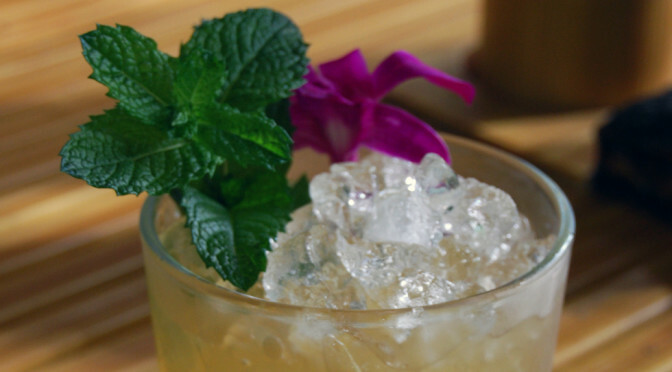 So there you have it: the perfect Mai Tai recipe. Fill a shaker with ice. Add the rums, Creole Shrubb, orgeat syrup, simple syrup and lime juice. Cap the shaker and shake vigorously for 15-20 seconds. Strain into a 12 oz double old fashioned glass filled with crushed ice. Garnish with a sprig of fresh mint (and an orchid if you have one). A word about orgeat syrup: Orgeat (Or-zhä(t)) is a sweet syrup made from almonds, sugar and rose water or orange-flower water. While you can make your own (which looks daunting), I suggest purchasing a high-quality one from Trader Tiki’s Hand-Crafted Exotic Syrups. Theirs is made from natural ingredients in small batches. For me, nothing says summer like tropical drinks. The Caribbean Royale is a great starter for an outdoor tiki party. They are quick and easy to make and it’s always nice to hand your guests a drink as soon as they arrive. Plus, it’s a lighter style cocktail that helps get the palate warmed up. Pour the white rum, banana liqueur and orange bitters in a cocktail glass. Top off with the chilled Prosecco. 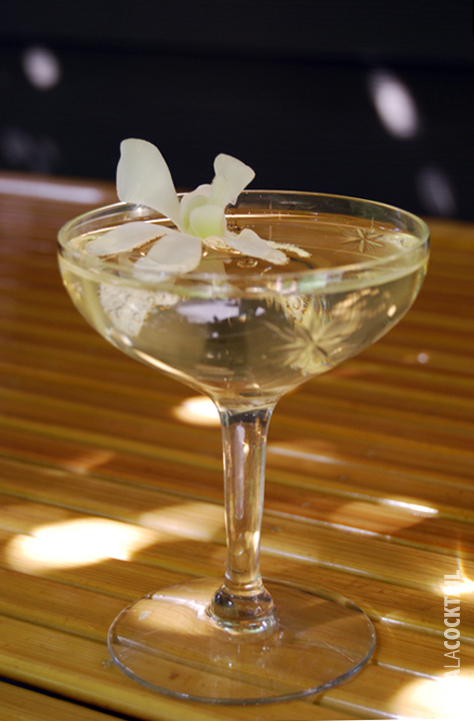 Garnish with a white orchid. Prosecco is an Italian dry sparkling wine and it mixes really well in cocktails. You don’t need to buy expensive Champagne for mixed drinks. 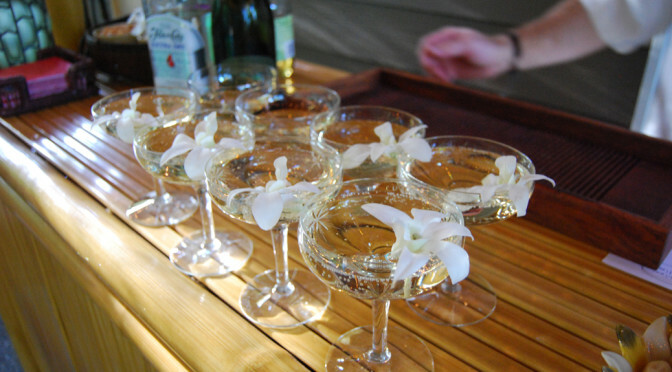 I almost always use Prosecco or Spanish Cava in cocktails when sparkling wine or Champagne is called for. When I was a kid, I used to go off to camp to learn basic life skills—like how to make a fire, swim, or paddle a canoe. Now that I’m a grown up, I went to CocktailCamp to learn valuable new life skills such as the history of rum, how the surface area of ice affects dilution and making cocktails with tea. Valuable lessons indeed. The first annual CocktailCamp PDX was held at the New Deal Distillery on April 11, 2010 in Portland, Oregon. Being both a speaker and a participant I can say it was a day well spent. I ended up kicking off the day because the first speaker cancelled at the last minute due to some sort of emergency. My presentation, Making Cocktails at Home, was designed as a primer for the aspiring home bartender. I covered topics such as: how to setup your own DIY home bar; the importance of home happy hour; cocktail party basics and a variety of tips. For those of you who missed it, there’s a great synopsis of the event on the CocktailCamp website and some nice press coverage by our local paper, The Oregonian. There are also some event photos taken by the event volunteers which are posted on Flickr. The default way to mix a drink is to stir it—not shake. Most of the classic cocktails were stirred to keep the ice fragments and air bubbles out of your drink. But certain drinks should be shaken. Check out my earlier post on Shaking vs. Stirring cocktails for more on this. Ice is the most overlooked part of the cocktail making process. The bottom line: the more surface area, the faster the dilution rate. So crushed ice will dilute the fastest, and large flat pieces of ice (or better yet—a Japanese ice ball) will dilute the slowest. White grapefruits are sweeter than pink or “ruby red” style grapefruits. Rhum Agricole is a lighter style of rum made in the French West Indies from sugar cane (rather than dark molasses). Rhum Agricoles can be consumed neat (especially the Rhum Vieux which is aged 3 years or more) or are commonly used in tropical Tiki style drinks and are paired with molasses-based rum. The bartender panel agreed that cocktails don’t generally go out of style—there is a cocktail for everyone depending on their taste. So, good news to all of you lemon drop drinkers out there! The next event I have in my sights is Tales of The Cocktail in New Orleans in July. Hope to see you there! We went to some friends’ house for Easter dinner and they sprung for roasted lamb, so I decided to return the favor with cocktails. Our hostess said she had some homemade limoncello on hand and I wanted to work around that and the lamb. After pondering what would be a good prelude to lamb, I remembered this tarragon vodka from Sub Rosa Spirits made right here in Portland. After perusing Sub Rosa’s website, I found the perfect drink: the Lemon Blossom. It has limoncello in it and I thought the herbal qualities of the vodka would be perfect. I found the original recipe by Sub Rosa to be a little too tart, so I decided to back off the fresh lemon juice by half and ended up with what I think is a nicely balanced cocktail. Our hosts didn’t complain either. Fill a shaker with ice. Add the vodka, elderflower liqueur, juice and Limoncello. Cap the shaker and shake vigorously for 15-20 seconds. 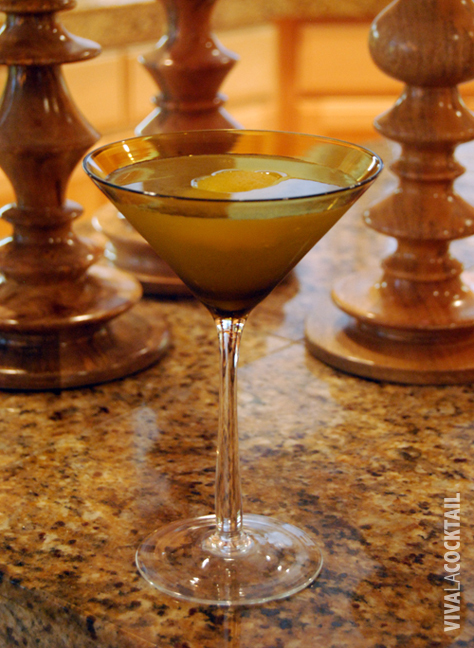 Strain into a 10 oz chilled martini glass. Garnish with a lemon peel. I made this drink first at home with commercially available limoncello. It was good, but it was even better later with the homemade limoncello. If you want to go the extra mile, I suggest you make or get your hands on some of the homemade stuff. There’s a great blog post on cocktailnerd’s site with tasting notes about various limoncellos. Also, if you want to find out where to buy Sub Rosa Tarragon vodka, visit their website for more information. One of my favorite restaurants in Portland is Fenouil, and they have this fabulous drink on their menu called the L’Oranger. It’s always reminds me of sitting outside on their patio overlooking Jameson Square on a warm (and dry) spring day. I was so taken with this cocktail that I swiped the menu (as I do) so I could recreate it at home. Here’s my take on Fenouil’s inspired drink. Fill a shaker with ice. Add the gin, orgeat syrup, juice and bitters (but not the ginger ale). Cap the shaker and shake vigorously for 15-20 seconds. 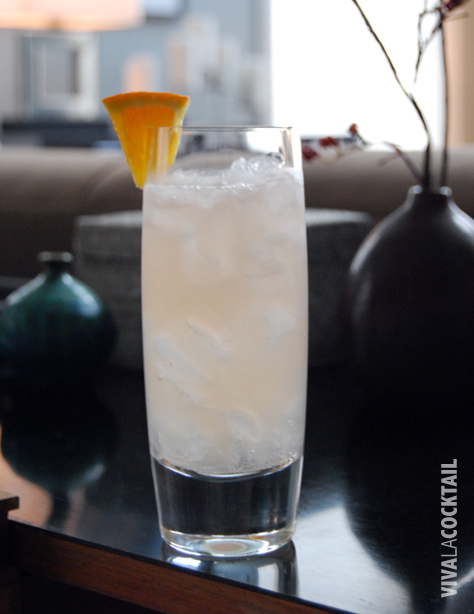 Strain into a 12 oz collins glass filled with ice. Top off with ginger ale. Garnish with an orange slice. I like to use 12 Bridges Gin (which is made in Portland) because it’s light on the juniper with notes of cucumber, melon and rose petals. I realize 12 Bridges is hard to get outside of Oregon, so you can substitute Hendricks Gin. I also recommend that you use fresh squeezed grapefruit juice and a craft brewed ginger ale like Thomas Kemper versus a mass-produced brand. But make sure you don’t use ginger beer! Here’s to spring. Triple Sec: do you know what’s in it? I want to call your attention to something that gets overlooked often: triple sec. It’s a basic ingredient in many cocktails such as the margarita, cosmopolitan, sidecar and hundreds of others. Triple sec is used as a flavoring agent and to make your drinks taste a little sweeter. Unless you’re paying attention to the label or drinking at an upscale bar, the triple sec that you’re probably drinking is poorly made. In fact, most name brand triple secs are made from vodka, artificial orange flavor and fructose. I know what you’re thinking: why spend 2 to 4x more? Considering that triple sec can make up to 20% of the ingredients in your glass, you’ll notice a big difference if you use the good stuff. And, if you’re going to the trouble of juicing fresh lemons and limes for your drinks (which you should be doing in my opinion), then you want natural ingredients in your triple sec. My advice when making drinks at home is to leave the triple sec at the store and upgrade to a higher quality substitution: Cointreau, Grand Marnier or Harlequin. Cointreau is considered a premium triple sec, which is made with the peels of bitter Caribbean and sweet Spanish and Brazilian oranges with neutral spirits, cane sugar, and water. It also has higher alcohol content (40%) than regular triple sec (15-40%). 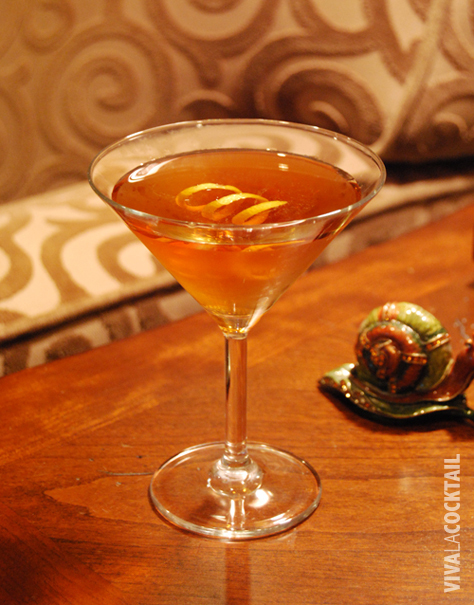 Grand Marnier is similar to triple sec, but is considered an orange-infused cognac. It’s richer and more complex than triple sec due to the distillation and aging process. Harlequin Orange Liqueur is similar to Grand Marnier in that it is made with cognac. In fact, I prefer Harlequin for mixed drinks because it is less expensive and the difference is difficult to distinguish in cocktails. Cointreau is lighter in taste than orange-infused cognacs, so it is nice for drinks that need a lighter touch—like a lemon drop or cosmo. I usually use Harlequin or Grand Marnier when I am looking for a richer taste, like in a margarita. Experiment and try out other high-quality brands of triple sec and orange-infused cognacs. Because at the end of the day, it’s all about what tastes good to you. Let me know which brands that you like. I don’t know about you, but there’s nothing worse than drinking a terrible margarita at the neighborhood Mexican restaurant. All you are able to taste is premade sour mix and you wonder if there’s any tequila in there at all. 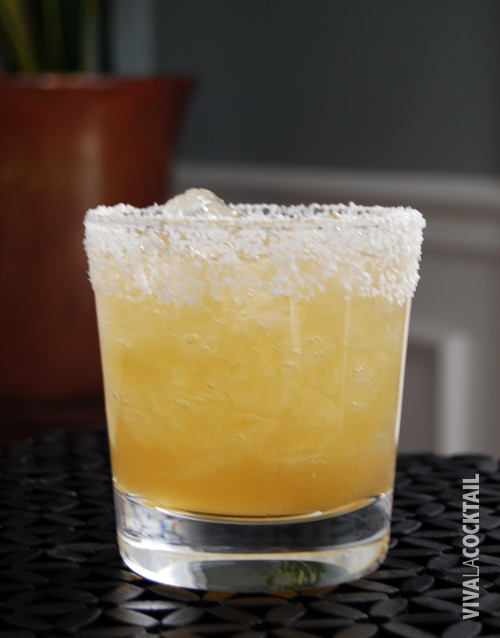 Well, you don’t have to suffer at home if you do one important thing—ditch the “margarita mix” and treat yourself to a REAL margarita. It’s surprisingly simple to make. Fill a shaker with ice. Add the tequila, orange liqueur, juices and agave nectar. Cap the shaker and shake vigorously for 15-20 seconds. Pour (without straining) into a 12 oz double old fashioned glass with a salted rim. You can use either Reposado or Añejo tequila, but make sure it is 100% pure agave. Otherwise, you are only getting half tequila and fillers. On the other hand, don’t use ultra premium tequila either because you can’t tell much difference with the additional ingredients. Ultra premium tequilas are meant to be sipped straight. That’s why I like to use Sauza Hornitos or a similarly priced brand. For those of you who don’t know, agave nectar is a sweetner and can be found in the grocery aisle (usually near the honey). 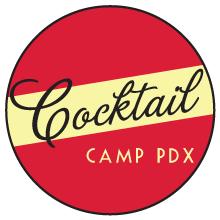 The first annual CocktailCamp PDX just sold out today—I’m both terrified and excited because this is my first public speaking gig about cocktails. 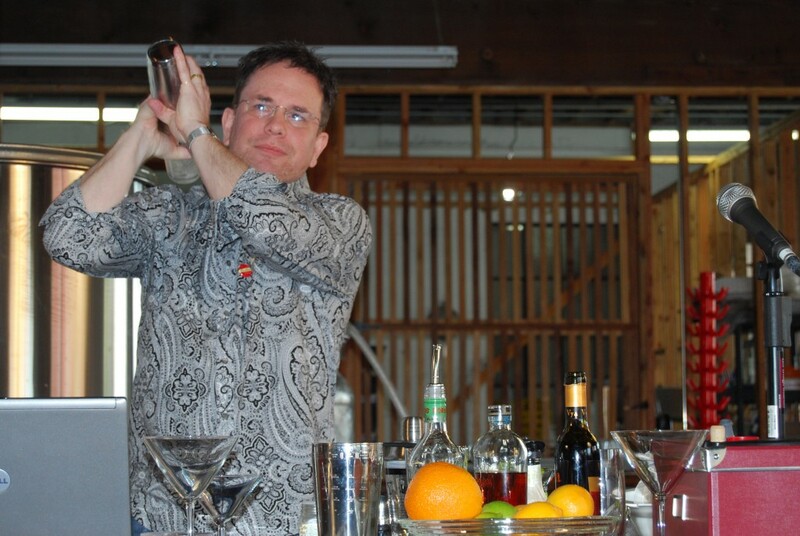 While I’m an accomplished public speaker on the subject of branding (and even wine), this is my first time talking about my passion—making cocktails. Naturally, I will be focusing on home cocktail culture, taking the home hobbyist perspective. This should be a great event as Portland has a strong mixology, cocktail and small batch distilled spirits community. For those of you who don’t know, CocktailCamp is an informal, interactive conference for people who enjoy making, drinking, and discussing cocktails. If you have a ticket, make sure you say hello at the event. I’ll be the one sweating profusely from 12:30—1:00pm. Being it’s St. Patrick’s day and this is a site devoted to cocktails, it seems fitting that there should be a post about it. In fact, this is the only holiday that is specifically designed around drinking (or at least this is what St. Patrick’s day has come to symbolize). You know, green beer and all of that. Fill a mixing glass halfway with ice. Add the whiskey, vermouth and green Chartreuse. Gently stir for 20-30 seconds and strain into a chilled martini glass. Garnish with a lemon twist. Chartreuse is a really amazing spirit—it’s made from 130 plants which have been distilled and blended into a liqueur. It’s also naturally green due to the ingredients. And, it’s made by French Carthusian monks, with the still secret recipe passed down for some 273 years. They made it because they needed the money to help perpetuate their order and dedicate their lives to prayer and meditation. You can read the full history on the Chartreuse website while you’re sipping your Tipperary. Many recipes call for the cocktail glass to be rimmed. This can be anything like sugar, salt or cocoa powder. This is used to enhance the taste of the cocktail or sometimes just for decoration. First, you moisten the rim of the glass with a lemon or lime. I like to use an orange because it is a little stickier than the others. Ideally you rim the outside of the glass to keep your ingredient out of the drink, but this takes a little practice and patience. Then you roll the glass in a plate filled with the sugar, salt or whatever until the rim is completely covered. Ideally, you want to do this about 15 minutes before you fill the glass. This gives time for the rim to dry and will keep your sugar, salt or whatever from falling off. This video from Small Screen Network featuring Jamie Boudreau demonstates the process well.